The first Europeans to reach the Cape of Good Hope were the Potuguese, led by the explorer Bartolomeu Dias, in 1488. In 1652 the Dutch East India Company established a supply camp in the area which later became Cape Town. In 1795 British forces invaded and took control of this area till 1803. In 1806 British forces returned and again occupied the territory. Under the Anglo-Dutch Treaty of 1814 the territory was ceeded to Britain. It then remained a British colony until it was incorporated into the Union of South Africa, as the Cape Province, on 31 May 1910. The first stamps to be issued by the colony were the Cape of Good Hope Triangulars on 1 September 1853. From 19 August 1910 till 31 December 1937 stamps of Cape of Good Hope were valid for use in any part of the Union of South Africa. Griqualand West was an area of some 40,000 square kilometres with Cape Colony on its south and the Orange Free State on its west. Sovereignty was disputed between the Orange Free State, Transvaal and the Griqua tribe which had settled there. Arbitration by the Lieutenant-Governor of Natal, R W Keate, gave the territory to the Griqua. The Griqua Chief, Nicholas Waterboer, immediatly offered to place the territory under British administration and this offer was accepted on 27 October 1871. The Orange Free State was paid a sum of £90,000 as compensation. In 1873 Griqualand West became a separate British Colony and in 1880 it became part of Cape Colony. 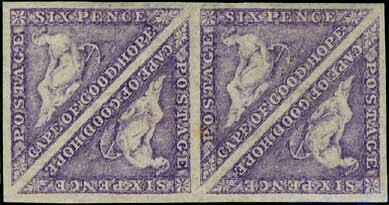 At first stamps of Cape of Good Hope were used in Griqualand West. From September 1874 stamps of Cape of Good Hope overprinted "G. W." or "G" were issued for Griqualand West until it was absorbed by Cape Colony in 1880. Remainders of the stamps, overprinted "G. W." or "G", were then used in Cape Colony as ordinary Cape stamps. A British settlement was founded in 1824 in what is now Durban (formerly D'Urban). In 1839 Afrikaans speaking Voortrekkers established the Natalia Republic in this area. On 4 May 1843 the territory was proclaimed as the British Colony of Natal. In 1897 Zululand was annexed to Natal. On 31 May 1910 Natal became a province in the Union of South Africa. Natal stamps were first issued on 26 May 1857. From 19 August 1910 till 31 December 1937 stamps of Natal were valid for use in any part of the Union of South Africa. The New Republic (Nieuwe Republiek) was proclaimed on 16 August 1884 as an independent Boer republic by a group of British and Boer mercenaries. The mercenaries had been granted land rights by Dinzulu (son of Cetshwayo the Zulu king who had died) for thier help in the succession to the Zulu throne. Part of the land grant was annexed by the British while the remainder of the New Republic was recognised as an independent state on 22 October 1886. Because of difficulties on 21 July 1888 the New Republic united with Transvaal. An organised postal service existed from December 1884 and the first stamps were issued on 7 January 1886. International mail was sent either through Transvaal of Natal. Neither of these administrations accepted New Republic stamps as valid so external mail had to have stamps of Natal or Transvaal in combination with those of the New Republic. On 3 February 1848 the area, later to be the Orange Free State, was proclaimed a British sovereignty by Sir Harry Smith and it was named the Orange River Sovereignty. On 23 February 1854 the Orange River Convention was signed. On 11 March 1854 the British left Bloemfontein and the Boer government took office and established the Orange Free State as a republic. In 1900 it was occupied by the British and named the Orange River Colony. In 1910 the colony joined the Union of South Africa as the Free State Province. The Orange Free State republic first issued stamps on 1 January 1868 and continued until it was occupied in 1900. The stamps were inscribed "Oranje Vrij Staat". When the area became a Crown Colony new stamps were issued inscribed Orange River Colony. From 19 August 1910 till 31 December 1937 stamps of the Orange River Colony were valid for use in any part of the Union of South Africa. During the 1830's and 1840's the Boers of Voortrekkers moved into the area which later became the Transvaal and formed several small Boer republics. On 17 January 1852 Britain signed the Sand River Convention with the Boers in this territory recognising their independence. This paved the way to the formation of the Zuid-Afrikaansche Republiek (South African Republic) in December 1856. Conditions in the Transvaal detriorated so much that in 1877 the British occupied the territory and remained till 1882. In 1882 the republic was restored again. The second Boer War started in 1899, Pretoria was occupied by the British on 5 June 1900. When peace was concluded in 1902 Transvaal became a British Colony. In 1910 the colony joined the Union of South Africa as the Transvaal Province. 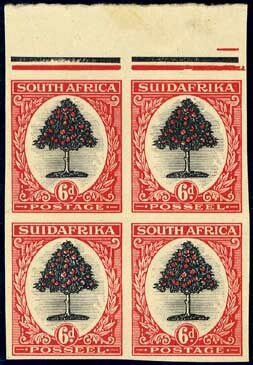 South African Republic stamps were first issued on 1 May 1870. During the British Occupation of 1877 to 1882 South African Republic stamps overprinted "V.R. TRANSVAAL" or stamps inscribed Transvaal were issued. With the restoration of the Republic new stamps were printed. When the territory was again occupied in 1900 by the British South African Republic stamps were overprinted "V.R.I." or "E.R.I." During the course of the 1900-2 Boer War local issues of stamps were authorised in Lydenburg, Rustenburg, Schweizer Renecke and Wolmaransstad. The government of the Zuid-Afrikaansche Republiek retreated northward to Pietersburg, when supplies of stamps were exhuasted stamps were produced locally in Pietersburg. When Transvaal became a Crown Colony new stamps inscribed Transvaal were issue on 1 April 1902. From 19 August 1910 till 31 December 1937 stamps of the Transvaal Colony were valid for use in any part of the Union of South Africa. Zululand was an independent kingdom from 1816. Following the Anglo-Zulu War of 1879 the British exiled Cetshwayo and divided Zululand into 13 regions, each administered by a kinglet. With continuous strife in the area the British decided to annexe the territory and declared it a Crown Colony on 19 May 1887. Zululand became part of Natal on 31 December 1897. After 4 years of negotiating the Union of South Africa came into being on 31 May 1910 when the colonies of the Cape, Natal, Transvaal and the Orange Free State became Province of the new dominion. From 31 May 1910 each Province continued to use its own stamps. From 19 August 1910 till 31 December 1937 stamps of any of the former colonies were valid for use in any part of the Union of South Africa. 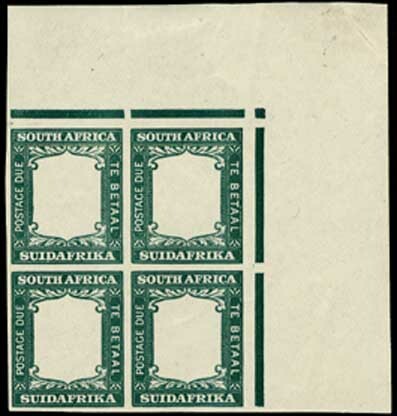 Union of South Africa Stamps were first issued on 4 November 1910. Following a whites-only referendum on 5 October 1960 the Union of South Africa became a republic and left the Commonwealth on 31 May 1961. Following free democratic elections in 1994 the Republic of South Africa was reinstated as a member of the Commonwealth on 1 June 1994. These 4 areas were first granted internal self-goverment at different times in the 1960's and 1970's and later independence. These independent "republics" were never recognised by the international community. They were all subsequently reincorporated into the Republic of South Africa on 27 April 1994. During their brief period of independence these "republics" issued stamps. Although these "republics" did not have international recognition their stamps were accepted for international mail. Founded in 1957 the Society leads the study of the Postal History and Usages of the 2nd Anglo-Boer War of 1899-1902. It holds regular meetings in London and Leamington, produces a quarterly journal and has published a number of handbooks on various aspects of the philately of the War. The extensive Society library is available to members. Establihsed as the Natal & Zululand Study Circle, in 1956, to encourage the study of the postal history, postage stamps, revenue stamps and postal stationery of Natal and Zululand during the colonial period and the inter-provincial period which followed. In 2006 ait was decided to change to the Cape & Natal Study Circle. The objects of the society were extended to cover the Cape of Good Hope, Griqualand West, British Kaffraria and the Transkeian territories in addition to Natal and Zululand. Founded in 1965 the Circle is devoted to the study of the stamps and postal history of the Transvaal / South African Republic which includes New Republic, Stellaland, Goshen, Pietersburg and early Swaziland. The Army Post Office Corps (M Company 24th Middlesex Volunteers) were mobilised and set sail for Cape Town on 14 September 1899 aboard the Dunnotar Castle. On arrival in Cape Town the Base Army Post Office was established in the newly built Cape Town Post Office building. A humble Zuid Afrikaansche Republiek cover bearing a 2d Vuurtheim 1887 stamp, postmarked Johannesburg March 19 1888, proves to be of considerable historical interest. Details of all known first and special flights to or from or within South Africa from 1961 to 1984. Illustrated listing of South African Airmails. Cancels, markings, services between South Africa & Europe 1876-1911, list of Cape mail contract sailings, value guide. Full colour booklet which was "Presented to the Sponsors, Jury, Organising Committee, Advertisers and those who gave generously of their time to the Egoli 2001 National Stamp Exhibition." A history of postal services and postal markings in Natal & Zululand, including a good deal on postmarks during the Anglo-Boer War. Detailed descriptions of all first and special flights to, from and within South Africa also South West Africa. Identification of the various issues of stampless Air Mail Letter Cards and Air Letters used by South African troops in the course of World War II (1941-1945) in the Middle East & Mediterranean. Describes and shows all the various stampless air mail letter cards and air letters used. Details the history of the production of the stamps by Perkins Bacon, the woodcuts and the De La Rue printings. Full details of the quantities printed, cancellations, essays and proofs, bibliography. The book was described as a "mine of information" in a review by Stanley Phillips in 1950. The author, David Alan Stevenson FICE, was awarded the Crawford Medal in 1951 for writing this book. 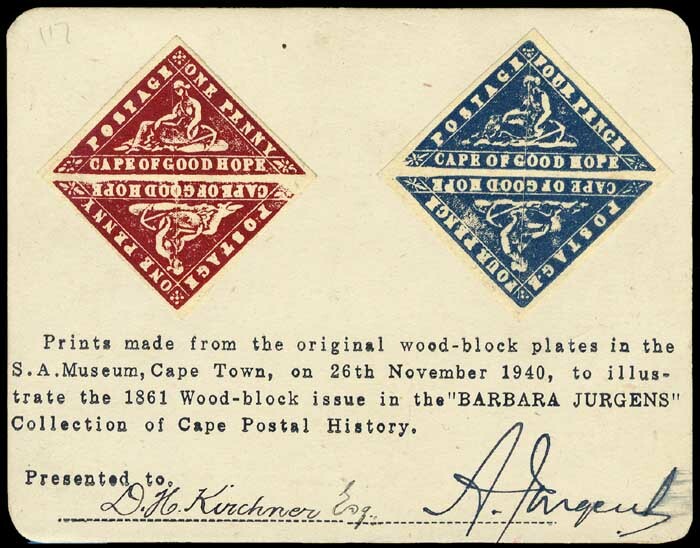 Barbara Jurgens was the daughter of Adrian Albert Jurgens author of "The handstruck letter stamps of the Cape of Good Hope from 1792 to 1853 and the postmarks from 1853 to 1910" and other philatelic books. The A A Jurgens - Cape of Good Hope, Barbara Jurgens Memorial Collection - Cape of Good Hope, is at the South African Cultural History Museum. A survey of the South African ½d pictorial. 1926-1949. The author describes the changes in the "Springbok Head" stamp. A total of nine different groups of printing of this stamp are identified and full details are given in this article. The author proposes a theory for the Perkins Bacon production of a master die and the production of the final plates. Note - I have acquired an almost complete run of Gibbons Stamp Monthly from January 1950 to May 2009. I will be working my way through these magazines and indexing them and adding notes in the same manner as above as I get to the articles.